The Le Gall dairy offers you its selection of dairy products made using traditional methods. These are produced using selected fresh creams that are slowly matured and churned after they have matured for over 15 hours. They are 100% natural, without any food colourings or preservatives. the maturation with selected enzymes followed by the slow and traditional churning of Brittany’s best fresh creams confirm LE GALL’s expertise. Our lump of butter – derived from our farmland criss-crossed by hedges and trees, and from a style of livestock farming that ensures awareness of animal wellbeing and the environment – is obtained in 24 hours, following the slow maturation of fresh creams and churning using the ancestral production method of Brittany's farms. Can be used for cooking special dishes or just for your everyday meals. For use on your table during festive meals or whenever you get together with friends or family! 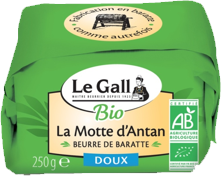 Le Gall’s pat of butter is produced by barrel churning, closely following the traditional method, thanks to the expertise of its Master Buttermakers and the selection of the best fresh creams. The pasteurised cream is slowly matured before being churned to offer you a typical intense flavour. 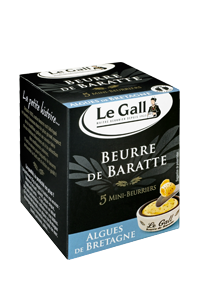 Le Gall’s tub of butter is produced by barrel churning closely following the traditional method, thanks to the expertise of its Master Buttermakers and the selection of the best fresh creams. The pasteurised cream is slowly matured before being churned to give you a typical intense flavour. This format preserves all of the butter’s qualities for longer. These butters are produced exclusively using unpasteurised raw creams. They are more fragile and do not keep as long. These are the most flavoursome butters. Churned butter made with raw milk undergoes only a little heat treatment. This gives it an authentic taste that is even more pronounced than a “traditional churn”. 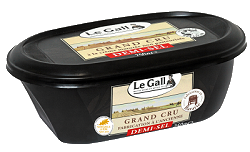 The Le Gall dairy is one of the latest to master Grand Cru butter production. Churned butter made with raw milk undergoes only a little heat treatment. This gives it an authentic taste that is even more pronounced than a "traditional churn”. The Le Gall dairy is one of the latest to master Grand Cru butter production. The butters are produced using organic matured cream, churned in the traditional way. Churned butter blends perfectly with different forms of sea salt like crystallised salt or fleur de sel. They will also add an extra touch of elegance to your table displays. without any food colourings or preservatives. Our Master Dairymen add carefully selected enzymes before leaving it to mature. Its slightly sour taste and its texture have made it a hit with the very best chefs and pastry chefs, who use it both hot and cold. Le Gall double cream has selected lactic enzymes added to it. Matured for a long time, it has a clean, thick texture. 100% natural origin, without any food colourings or preservatives. This fresh cream is made using organic milk. A double cream that can be used both hot and cold. It keeps for a long time and can be stored at ambient temperature, so you can always have it on hand. This organic fresh double cream is slightly matured using enzymes specific to the Le Gall dairy, giving it a unique and tasty mild nutty flavour. Suitable for both hot and cold use, for whipping or topping. The Le Gall dairy guarantees you a high-quality milk that is testament to the commitment shared with producers. and a slick packaging process. The Le Gall dairy participates in the development of environmentally-friendly, harmonious and sustainable farming, to produce a high-quality organic milk. We collect the milk from carefully selected farms in Brittany. We only collect milk from BRITTANY (French départements 22, 29 and 56). Its carton packaging obtains the best results in the main categories affecting the environment (FSC carton). Great organic milk from Brittany’s farms! We collect the milk from carefully selected farms in Brittany. The cocoa and sugar used in the recipe are Fairtrade. Le Gall chocolate milk is a source of calcium. It provides 15% of the Recommended Daily Allowance. Ideal for refuelling after exercise! We collect the milk from carefully selected farms in Brittany. This milk, which is a source of calcium, counts towards your Recommended Daily Allowance. Trouvez nos produits près de chez vous !